The passport is the most important document for the overseas Filipino workers (OFW) and even for the Filipinos who frequently travel outside the country. We should take good care of it. 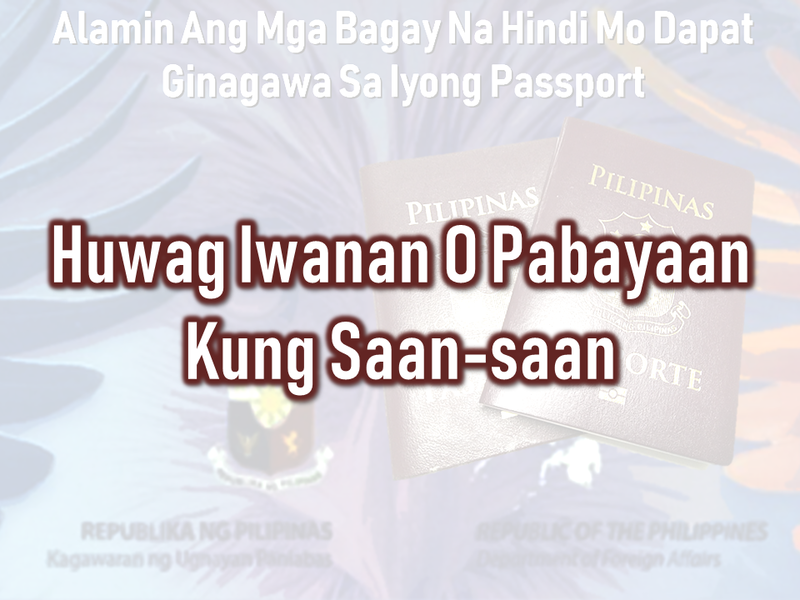 It is not easy to acquire one, especially when even getting an online appointment is like passing through a needle hole although there is a special courtesy lane for OFWs which do not require an online appointment. After securing an appointment, you need to go through DFA passport processing and submit the needed documents. The new electronic passport (E-passport) validity was extended to so you will be working with it for ten years unless the pages are already full of stamps. In that case, you may need to apply for a new one. 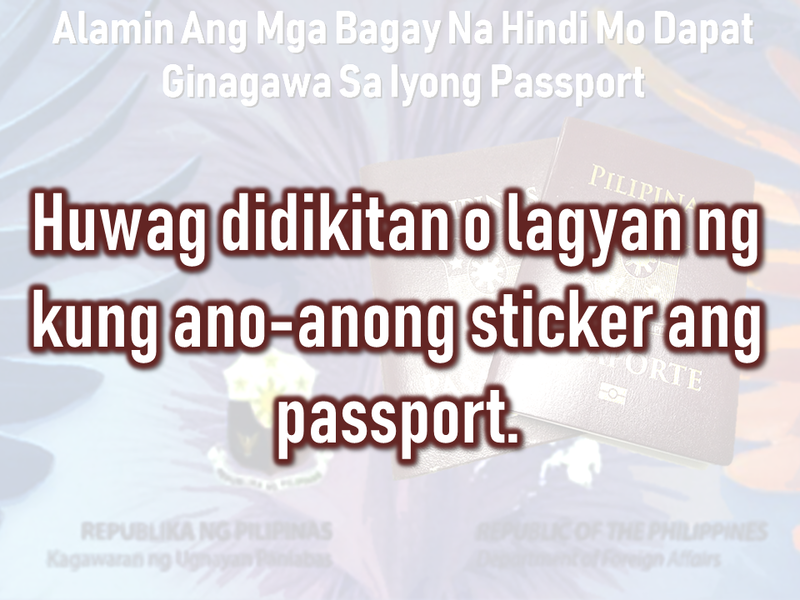 There are things that we should not do with our passport. Taking care of it has to be a way of life. You are given a maximum of six months to claim it or have it delivered to you, after applying for your Philippine passport. 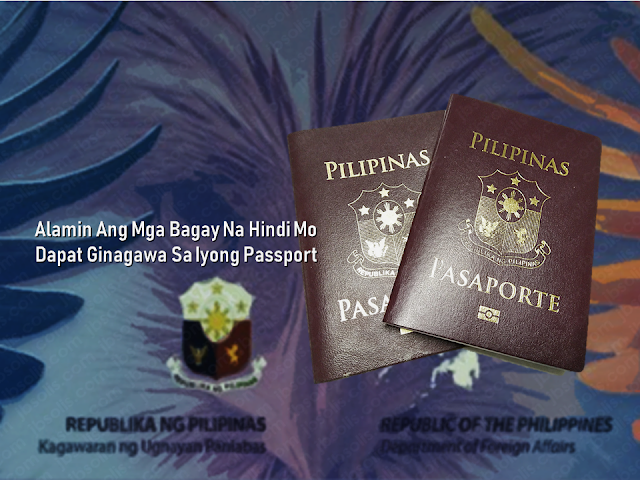 All unclaimed passports beyond that period are canceled automatically in compliance to Department Order No. 37-03. You would just be wasting time and money going through the process of preparing your documents, the actual application and paying for it if you would just abandon it. Keep it out of children's reach! A Chinese man was put on hold in Korea after his kid doodled on his passport. 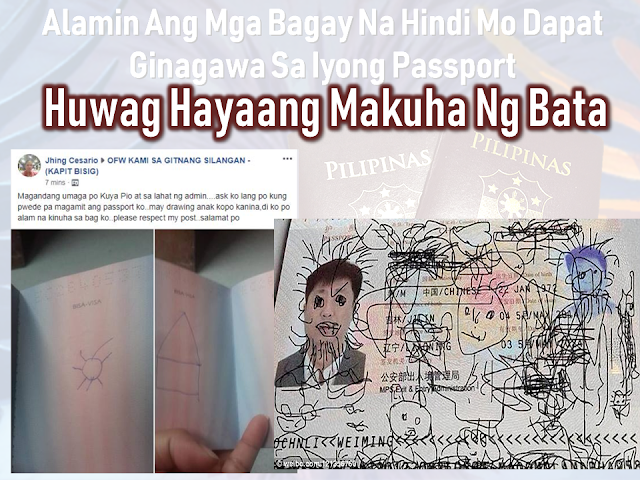 The man was preparing to go back to China when he found out that he had made a huge mistake by leaving his passport with his son who treated his passport as a sketchbook. If you let them vandalize your passport, it is not their fault. Any unauthorized sketches and signature could render your passport invalid for travel. When traveling regard your valid passport as the most essential thing which should be on top of your checklist together with your credit card, cash, and clothes. 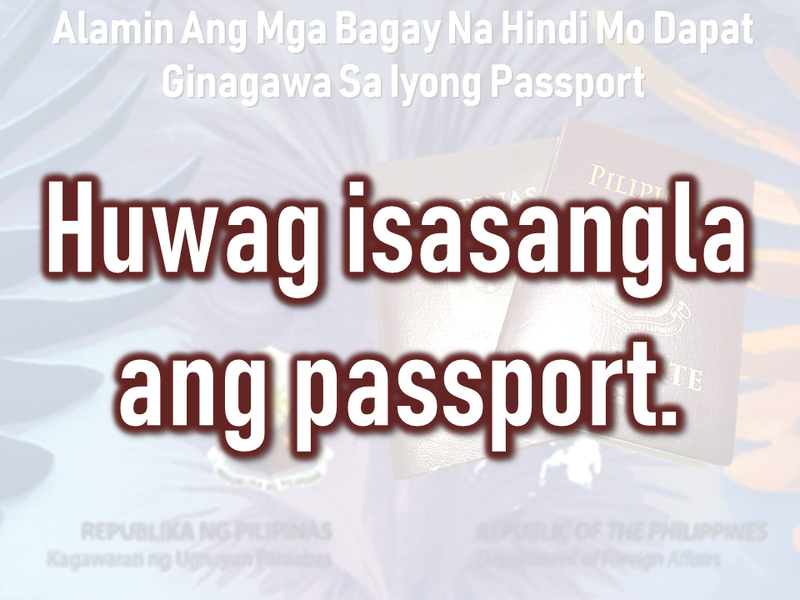 immediately report the loss of your passport to the Consular Records Division of the Department of Foreign Affairs (DFA) if you’re in the Philippines, or any Philippine consulate or embassy closest to you if you are abroad. 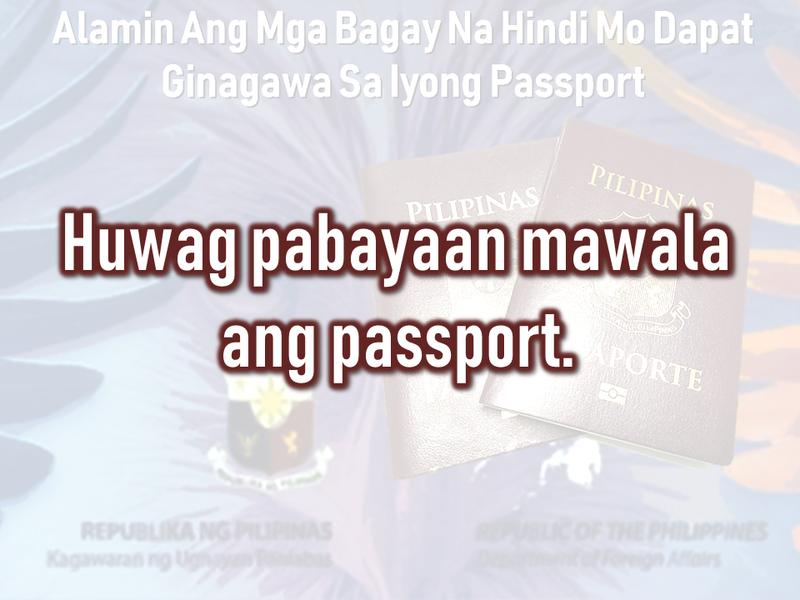 You’ll need to submit documents like an Affidavit of Loss and Police Report if your passport is still valid, and a photocopy of its first and last pages if available. 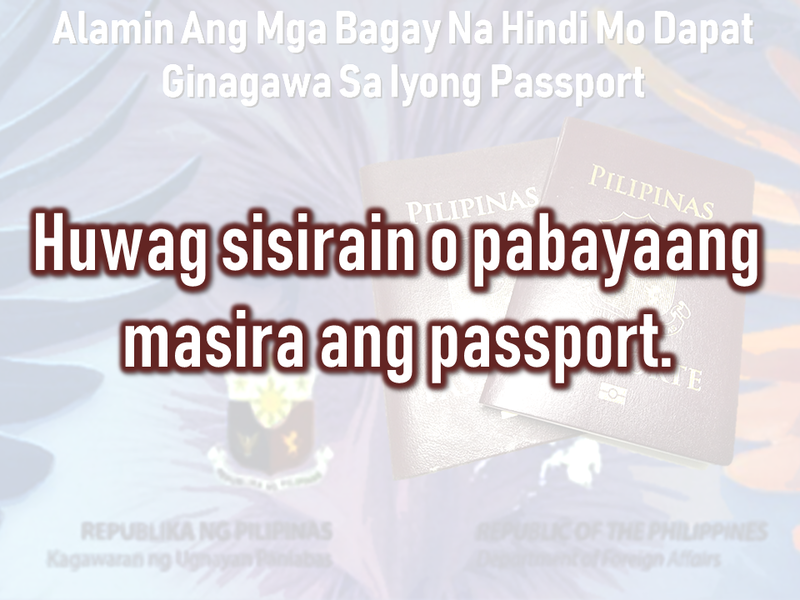 Another case that would render your passport invalid is getting it damaged, whether by getting wet, having a torn page or sustaining a hole and other markings. In this case, you may need to apply for a new for a passport with a notarized Affidavit of Mutilation attached. You also need to submit a photocopy of the first and last pages of your passport. Do not paste or staple anything on the cover of your passport that may damage the electronic chip on it, or paste/staple printed visas and any stickers on its pages. A common practice used by OFWs, although it is illegal, are passports being used as a loan collateral. Passports are government property and not your own. If you get caught using your passport to loan money from any individual, you can get your travel document canceled and it may affect your next passport applications.